This guide will walk you through how to use an Add to Cart link or button instead of a registration form. On the right sidebar, set Display Registration Form to No. We want to use the Add to Cart link instead of the standard registration form, so we need to disable the registration form for this event. Attendees will still be required to fill out all the information, just later in the process. Fill out your event as you normally would. When you are done, add the following shortcode to the event description. In the example below, I am using the shortcode with some additional parameters. These parameters sets the link text to “Register for this Event” (default is “Add to Cart”), moves directly to the cart page after being clicked (default is to change the link text to a View Cart link, allowing users to add more events to the cart), and sets the text that displays while it’s redirecting to “Redirecting to cart…”. 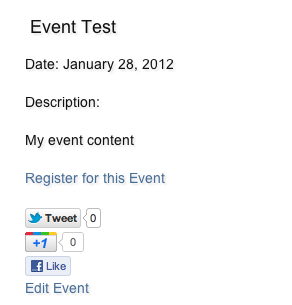 Your event will now display the cart link instead of the registration form. Using the above method, you can use an image or a button instead of text. Doing so requires some basic knowledge of HTML <img> tags. If you are going to use this method, be sure you make the required changes in HTML view in the editor. The reason for this is that the single quotes ( ' ) in the <img> tag are very important, and if you do this in the visual editor, the editor will replace the single quotes ( ' ) with double quotes ( " ) and break the shortcode.